Eleriin Müüripeal (Estonia, 1996) started her musical education at the age of five, studying piano at Tallinn Nõmme Music School. 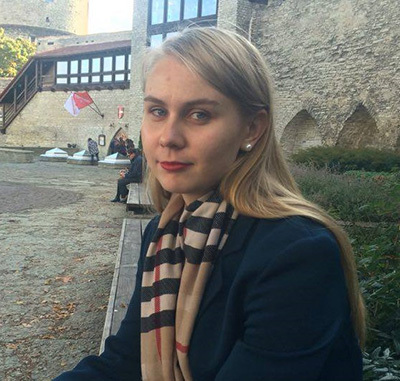 She continued her music studies at Tallinn Georg Ots Music School, where she studied choral conducting with prof. Merike Toro, whilst continuing her piano studies and beginning her singing studies. In 2015 she started her studies at Sibelius Academy, Finland, where she is currently studying choral conducting with prof. Nils Schweckendiek. She has further studied choral conducting in various masterclasses with teachers including Paul Hillier (along with Ars Nova Copenhagen), Daniel Reuss, Andrew Parrott, James Wood and Marco Ozbic, to name a few. She has been studying singing at the Sibelius Academy with prof. Outi Kähkönen since 2016. Having sung in various ensembles and choirs both in her native Estonia and in Finland, she currently a member of EMO Ensemble residing in Espoo, Finland. She is also active as a solo singer and an accompanist.